little beaten cinnamon you may [glouse?] them as you do tarts and send them hot to the table 1st short Crust and 2d Part Royal 1st one pound of Butter to a pound of fine flour 1 egg yolk and white well Beaten rub the Butter in very fine and a little water to wet it 1 spoonful of sugar finely powdered 2d one pound of fine flour work it up with half a pound of Butter 2 ounces of sugar and four eggs. 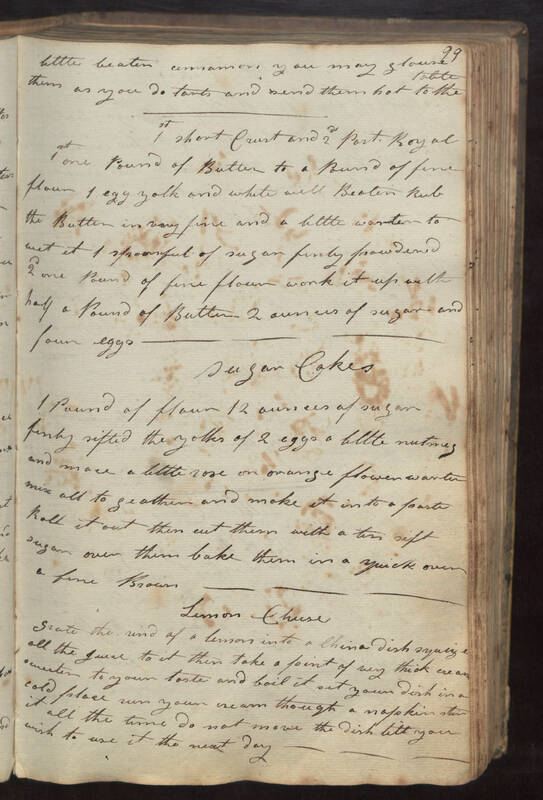 Sugar Cakes 1 pound of flour 12 ounces of sugar finly sifted the yolks of 2 eggs a little nutmeg and mace a little rose or orange flower warter mix all to geather and make it into a paste Roll it out then cut them with a tin sift sugar over them bake them in a quick oven a fine Brown. Lemon Cheese Grate the rind of a lemon into a china dish squeze all the juice to it then take a pint of very thick cream sweeten to your taste and boil it set your dish in a cold place run your cream through a napkin stir it all the time do not move the dish till you wish to use it the next day.